Intestinal organoid cultures are established from whole crypts and do not allow the analysis of self-renewal and differentiation in a cell-specific fashion. 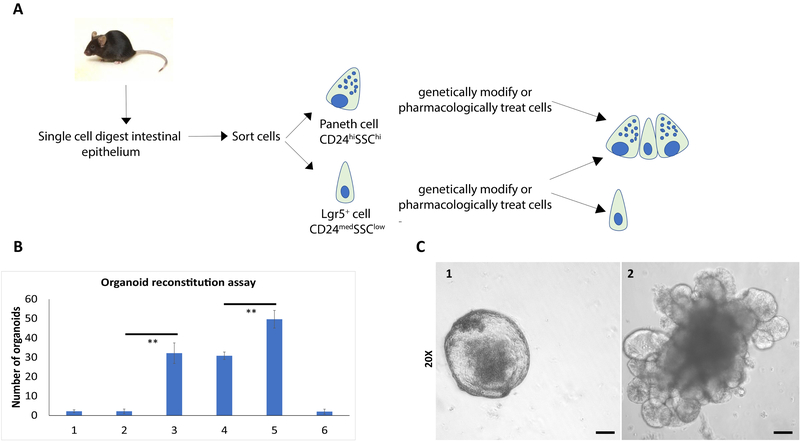 This protocol describes reconstitution of sorted stem (Lgr5+) and niche (Paneth) cells, which give rise to organoids while enabling their prior biochemical and genetic modification and functional analysis. Schewe, M., Sacchetti, A., Schmitt, M., Fodde, R. The Organoid Reconstitution Assay (ORA) for the Functional Analysis of Intestinal Stem and Niche Cells. J. Vis. Exp. (129), e56329, doi:10.3791/56329 (2017). The intestinal epithelium is characterized by an extremely rapid turnover rate. In mammals, the entire epithelial lining is renewed within 4 - 5 days. Adult intestinal stem cells reside at the bottom of the crypts of Lieberkühn, are earmarked by expression of the Lgr5 gene, and preserve homeostasis through their characteristic high proliferative rate1. Throughout the small intestine, Lgr5+ stem cells are intermingled with specialized secretory cells called Paneth cells. Paneth cells secrete antibacterial compounds (i.e., lysozyme and cryptdins/defensins) and exert a controlling role on the intestinal flora. More recently, a novel function has been discovered for Paneth cells, namely their capacity to provide niche support to Lgr5+ stem cells through several key ligands as Wnt3, EGF, and Dll12. When isolated ex vivo and cultured in the presence of specific growth factors and extracellular matrix components, whole intestinal crypts give rise to long-lived and self-renewing 3D structures called organoids that highly resemble the crypt-villus epithelial architecture of the adult small intestine3. Organoid cultures, when established from whole crypts, allow the study of self-renewal and differentiation of the intestinal stem cell niche, though without addressing the contribution of its individual components, namely the Lgr5+ and Paneth cells. Here, we describe a novel approach to the organoid assay that takes advantage of the ability of Paneth and Lgr5+ cells to associate and form organoids when co-cultured. This approach, here referred to as "organoid reconstitution assay" (ORA), allows the genetic and biochemical modification of Paneth or Lgr5+ stem cells, followed by reconstitution into organoids. As such, it allows the functional analysis of the two main components of the intestinal stem cell niche. The intestinal epithelium is the most rapidly self-renewing tissue in the mammalian body and, as such, has been the object of a plethora of studies aimed at the identification and functional characterization of the adult stem cells residing at the bottom of the crypt of Lieberkühn, earmarked by expression of the Lgr5 gene and dependent on canonical Wnt signals1. Notably, Lgr5+ stem cells are flanked and supported by specialized niche cells, i.e. Paneth cells, which also depend on Wnt signaling for their maturation2. Together, these two cell types underlie self-renewal of the intestinal epithelial lining and preserve the daily homeostatic equilibrium: Lgr5+ stem cells rapidly divide and give rise to progenitor and more specialized intestinal epithelial cells; Paneth cells provide essential niche factors (e.g., Dll1, Wnt3, EGF) to Lgr5+ stem cells2. The capacity of intestinal crypts when plated ex vivo to form organized and self-renewing structures called organoids, or "mini-guts", has been exploited as an experimental tool to provide insight into processes such as self-renewal and differentiation in normal and pathological conditions including cancer4. Organoid cultures have been established from several tissues, including the intestine, pancreas, liver, and kidney, from both mouse and human samples4. The extraction method and the growth factors employed to develop these organoid cultures are tissue-specific and designed to drive multi-lineage differentiation and mimic as closely as possible the original stem cell niche in vivo. Organoids may have potential applications including the treatment of genetic diseases, the assessment of therapeutic efficacy in cancer, the analysis of drug toxicity, or the study of organogenesis in vitro5. Overall, the main limitation of organoid cultures when established from tissue samples is a lack of cell-specificity. For example, intestinal organoids established from whole intestinal crypts do not allow the analysis of individual cellular components encompassed within the tissue source (e.g., whole crypts contain Lgr5+, Paneth, and progenitor cells). Here, we describe a novel method, referred to as ORA, that combines the advantages of intestinal organoid cultures with the functional analysis of its most fundamental components, namely stem (Lgr5+) and niche (Paneth) cells. This is achieved through the unique ability of Paneth and Lgr5+ cells to physically associate with each other when co-incubated and give rise to organoids2,6,10. We took advantage of this feature and pre-treated the two cell types individually before allowing them to reconstitute organoids. When doing so, each cell component can be exposed to any given drug, growth factor, biochemical inhibitor, genetic modification, or chemical treatment prior to reconstitution and organoid formation. Therefore, using the ORA assay will allow the determination of whether a specific drug treatment or genetic modification has a specific effect on the stem cells or their niche counterpart. All procedures were done according to local animal welfare laws and guidelines. Autoclave 1 set of intestinal scissors, normal scissors, and forceps in a sterile container. Place a 96-well (flat bottom) dish in an incubator at 37 °C. Prepare 10 mL of complete culture medium with the reagents listed in table of materials. Incubate the complete medium at 37 °C in a water bath. Thaw reconstituted basement membrane by placing it in an ice bucket. The reconstituted basement membrane will become liquid at 4 °C . Fill 4 Petri dishes with cold phosphate-buffered saline or abbreviated PBS (4 °C). Sacrifice by CO2 inhalation a Lgr5-eGFP-IRES-CreERt2 mouse on a C57BL6/J background. Dissect the peritoneum longitudinally with a pair of scissors. Hold the stomach with the forceps and cut it transversally in half. Using the intestinal scissors from now on, pull out the intestine and place it in a Petri dish containing PBS. NOTE: Intestinal scissors have a sharp and a blunt tip. The blunt tip of these scissors is meant to not damage the crypt-villus architecture while opening the intestine. Start by placing the blunt tip into the stomach and gently push it through the pylorus. Proceed by cutting with the scissors and pulling with the forceps. Once the whole small intestine is opened longitudinally, wash it in cold PBS by holding it with the forceps and gently rinse it in the PBS solution with U-shaped movements. Once all the stool remnants are cleared, proceed to flatten the intestine on a cutting board, luminal side up. The luminal side is easily recognizable by the absence of blood vessels and by its pale appearance when compared with the outer part. With a glass slide, gently remove the villi by scraping the flattened intestine. Perform this step twice along the whole length of the tissue. Cut the small intestine with a sterile surgical blade into 2 - 5 mm pieces. Place the small intestinal fragments in a 50 mL tube containing 10 mL of ice cold PBS. Clean the tissue fragments, removing any remaining impurities by pipetting them up and down in the PBS. Discard supernatant and repeat this step until the PBS is completely clear. Add 15 mL cold PBS, to bring the total final volume of PBS to 25 mL. Add 2 mM ethylenediaminetetraacetic acid (EDTA) and incubate for 45 min on a roller at 4 °C. Add 10 mL of PBS and detach the crypts by harshly pipetting the tissue fragments up and down (at least three times). Collect the supernatant. Repeat step 2.13 four times. Add culture medium to reach a final volume of 50 mL. Pellet the cells by centrifugation (300 x g for 5 min). Resuspend the pellet in 10 mL of culture medium and pellet the crypts by centrifugation (80 x g for 3 min). Discard the supernatant of the pelleted crypts and resuspend them in 1 mL trypsin like-enzymes together with 50 µL DNAse (50 µg/mL). Incubate the cells in a water bath at 32 °C for 2 min. Add 10 mL of culture medium. Dissociate the crypts into single cells by harshly pipetting up and down at least 5 times. Filter the solution through a 40 µm strainer (to eliminate clumps and other impurities) and pellet the single cells at 300 x g for 5 min. Add to the cell suspension BV421 Lin- (CD31, CD45, TER119) at a concentration of 1:100, and CD24-APC and CD117-PE both at a concentration of 1:250 antibodies for 30 min. Centrifuge the sorted cells at 300 x g for 5 min. Resuspend the cells in 100 µL medium with the components described as in 1.3 (see the Table of Materials). Treat (e.g., by chemical or genetic modification) the Paneth cells (n = 2000) or the Lgr5+ stem cells (n = 2000). To treat cells, use 5 µL of liposome-mediated transfection reagent in a total volume of 100 µL culture medium and small interfering RNA (siRNA) at a concentration of 100 nM. Incubate for 30 min at 37 °C for siRNA or for the time necessary for the chosen modification. Wash the cells twice in 500 µL culture medium. Centrifuge at 300 x g for 5 min and resuspend the cells in 10 µL culture medium. Pool the two cellular components (Paneth or Lgr5+ cells) in a 20 µl total volume and centrifuge at 300 x g for 5 min at RT. Co-incubate the Paneth and Lgr5+ cells for 10 min at RT. Remove 10 µL of the supernatant and leave a meniscus of liquid to be sure to not aspirate the cell pellet. Add 30 µL of reconstituted basement membrane to the cells for a total volume of 40 µL, resuspend the cells and plate in a pre-warmed 96 well plate. After 10 min, add 200 µL of complete medium (see the Table of Materials). Change medium every 48 h.
Count organoid multiplicity at day 5. The organoid reconstitution assay allows the separate functional analysis of the essential niche and stem cell components of the intestinal epithelium, here demonstrated by small interfering RNA (siRNA) of the Apc gene. To achieve this aim, we first utilized fluorescent activated cell sorting (FACS) to separate 8000 Lgr5+ cells and 6000 Paneth cells from inbred C57BL6/J mice. In Figure 1a, a flowchart of the ORA assay is depicted. Organoid reconstitution capacity was assessed by incubating Lgr5+ cells with siRNA oligonucleotides directed against the mRNA of Apc or encompassing a scrambled sequence (SCR) as a control. After treatment, the same siRNA-treated Lgr5+ cells were either directly plated in organoid medium/reconstituted basement membrane, or incubated with an equal number of untreated Paneth cells and subsequently plated out. As a control, untreated Lgr5+ cells were plated alone (i.e., without Paneth cells) to determine the number of organoids derived from untreated Lgr5+ cells. Furthermore, as an additional control, Paneth cells alone were plated to check for the background of organoid formation derived from the contamination of Paneth-Lgr5 cell doublets sorted in the Paneth cell gate. As expected, siRNA mediated knockdown of the murine Apc gene in Lgr5+ stem cells (and the resulting activation of the canonical Wnt/β-catenin signaling pathway) positively affected organoid multiplicity when compared to untreated counterparts or the scrambled control (Figure 1B). The constitutive Wnt activation also rescued the requirement for Paneth cells, as previously reported1. Furthermore, these organoids appeared as hollow spheres (spheroids), a well described phenotype for Apc-mutant or Wnt-stimulated organoids (Figure 1C, panel 1), when compared with the morphology of those obtained from Paneth-Lgr5 cell doublets (Figure 1C, panel 2)8,9. Collectively, these results demonstrate that reconstituting Paneth cells and Lgr5+ cells can give insight on cell-specific mechanisms within these two cell types; morphological analysis of the organoids by microscopy can be valuable in this respect since the morphology of the organoids reflects their cell composition (e.g., spheroids are constituted by Lgr5+ cells only). Another important parameter to be taken into account is the complexity of the organoid (e.g., the number of crypt budding events). Figure 1. Effect of siRNA mediated knockdown of Apc in Lgr5+ cells. (A) Flowchart of the experimental procedure. Lgr5EGFP reporter mice (Lgr5EGFP-IRES-creERT2)1 were employed as a source of Lgr5+ sorted stem cells. Paneth cells were sorted as indicated and previously described6,7. (B) Organoid multiplicity observed upon reconstitution of Lgr5+ stem cells and Paneth cells. When indicated cells were pretreated with siRNA oligonucleotides directed against the Apc (siRNA Apc) or scrambled (SCR) control sequence. The asterisks indicate statistically significant differences (n = 3, *p <0.05 **p <0.001). Error bars refer to SD. (1) Lgr5+ cells, (2) Lgr5+ cells SCR, (3) Lgr5+ cells siRNA Apc, (4) Lgr5+ cells + Paneth cells, (5) Lgr5+ cells siRNA Apc + Paneth cells, (6) Paneth cells. (C) Representative images of organoids derived from (1) Lgr5+ cells siRNA Apc, (2) Lgr5+-Paneth cells. Scale bar = 10 µm. Please click here to view a larger version of this figure. The ORA allows the refined functional analysis of the two essential components of the intestinal stem cell niche, namely Lgr5+ and Paneth cells. This approach has been previously employed by us and others with slight modifications6,10,11. Here, we present the ORA procedure as a reproducible and standardized laboratory protocol. Also, we report on the effects of Apc downregulation in Lgr5+ stem cells, as an example of the possibility of implementing genetic (or biochemical6) modifications to the sorted cellular components. Collectively, the data show that siRNA mediated knockdown of Apc enhances the stem cell function of Lgr5+ cells, as indicated by the increased organoid multiplicity (Figure 1B). Several advantages of using intestinal 3D organoid cultures have already been listed in reviews4, including the striking resemblance of their organization with that of the crypt-villus architecture in vivo, especially when compared to the architecture from standard 2D culture methods with immortalized cell lines. However, one of the major limitations of this method is that in most cases, organoid cultures are established from whole intestinal crypts, a process which does not allow the functional analysis of its individual components and, in particular, of the stem and niche cells, here represented by Lgr5+ and Paneth cells, respectively. The ORA overcomes these limitations. Stem and niche cells can be separately sorted from the animal and reconstituted to generate organoids. As such, this approach allows the functional analysis of these two cellular components by either employing mouse models carrying specific genetic modifications or exposed to specific stress factors (e.g., DSS and/or specific diets); or by directly modifying the sorted cells genetically (siRNA, CRISPR-Cas9) or biochemically, before reconstituting them to generate organoids. The multiplicity, morphology, self-renewal capacity, and extent of differentiation (and eventually the extent of metaplastic changes) of the resulting organoids can be employed as functional read-outs. In the case of genetic manipulation, such as siRNA, when a morphological effect is not evident, cells should be analyzed one hour after transfection to validate the knockdown of the mRNA of interest. Paneth and Lgr5+ can also be sorted from mice genetically engineered with different mutations to study whether different mutations in stem and niche cells lead to altered interactions between these two cell types and a different organoid formation efficiency and/or morphology. Critical steps within the protocol are the removal of the villi (step 2.7) and the resuspension of the cells in HBSS/2%FCS (step 4.1). Removal of the villi is critical to enrich Paneth and Lgr5+ cells located in the lower third of the crypts and to improve the efficiency of sorting. Although FACS protocols commonly suggest sorting cells in PBS/FCS, the use of HBSS instead of PBS increased and kept cell viability stable throughout the sorting time. Other important steps are steps 4.7 and 4.8, where physical association of Paneth and Lgr5+ cells allows these lineages to form doublets that will eventually give rise to organoids. Barker, N., et al. Identification of stem cells in small intestine and colon by marker gene Lgr5. Nature. 449, 1003-1007 (2007). Sato, T., et al. Paneth cells constitute the niche for Lgr5 stem cells in intestinal crypts. Nature. 469, 415-418 (2011). Clevers, H. Modeling Development and Disease with Organoids. Cell. 165, 1586-1597 (2016). Cantrell, M. A., Kuo, C. J. Organoid modeling for cancer precision medicine. Genome Med. 7, 32 (2015). Schewe, M., et al. Secreted Phospholipases A2 Are Intestinal Stem Cell Niche Factors with Distinct Roles in Homeostasis, Inflammation, and Cancer. Cell Stem Cell. 19, 38-51 (2016). Roth, S., et al. Paneth cells in intestinal homeostasis and tissue injury. PLoS One. 7, e38965 (2012). Rodriguez-Colman, M. J., et al. Interplay between metabolic identities in the intestinal crypt supports stem cell function. Nature. 543, 424-427 (2017). Dow, L. E., et al. Apc Restoration Promotes Cellular Differentiation and Reestablishes Crypt Homeostasis in Colorectal Cancer. Cell. 161, 1539-1552 (2015). Igarashi, M., Guarente, L. mTORC1 and SIRT1 Cooperate to Foster Expansion of Gut Adult Stem Cells during Calorie Restriction. Cell. 436-450 (2016).